Do you have a Huawei phone restricting you to the sim card you use. you can do away with that by following the steps below. This article focus on unlocking a customized Huawei mobile. it is totally a free way, learn how to unlock you huawei phone it. Imagine the situation i was into when i got stuck with MTN customized phone produced by Huawei. i really wanted to use a Glo sim in the phone but noway untill i got to know How to unlock Huawei Cell Phone. i thought is impossible but it really worked . 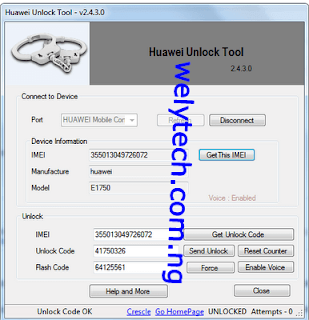 in this tutorial iswill be using a software called Unlock Huawei (you an google it out). This software tool can help you to unlock your Huawei device by yourself on your computer . If you want to use this tool for unlock your cell phone you must provide IMEI number . You can chek your IMEI code by typing *#06# on your keyboard or just remove the batery . You must know this number and you must use it in the unlock Huawei procedure . So before unloking Huawei in some local store or internet site cost us all some money , but now whit this hack software tool we can unlock it for free yet . Before i go on, i want to let you know that there three ways you can unlock your Huawei phone. in this tutorial i will be using Unlock Huawei tool from this page of free. it is totally free you don't need money to unlock you mobile phone. First of all you must download the unlock Huawei tool . This tool you will find it very easy if you search on Google.com. The unlock Huawei tool works on any model of Huawei . If you want to ask something about the tool or the procedure feal free to comment on this post and our team will respond you in the next 24 h.
Hope is was easy to unlock Huawei Cell Phone share with friends.